The top public health official in the state of California has all but declared war on e-cigarettes, in a pair of official reports that focus closely on the products’ purported health risks while repudiating their claimed benefits. Ron Chapman, outgoing director of public health and state health officer, wants e-cigs to be brought into California’s tobacco regulatory framework, and in the meantime hopes for a campaign employing the public health, medical, and childcare communities to spread information about toxicity and poisoning risks. His department will also work with the education department and school officials to reach educators and young people, according to the reports. However, Chapman himself will leave his job this week; his departure, unconnected with the issue of e-cigs, was announced in December. Whether his positions are maintained by his successor, or are simply parting shots, remains an open question. In any case, his swingeing attack comes just days after a prominent Californian senator, Mark Leno, introduced proposed legislation that would prohibit vaping in most public places – just as smoking has long been curtailed in the state, a tobacco control pioneer. And it contrasts with a much milder approach to e-cigs also expressed this week by the U.S. surgeon general. “There is a need to treat e-cigarettes in a comprehensive manner that is consistent with how we approach traditional cigarettes,” says one of Chapman’s reports, which even describes e-cigs as “a community health threat” in its title. He cites increases of around 100% in the number of Californian adults who had used e-cigarettes in the previous 30 days between 2012 and 2013, and a trebling of the percentage among 18-to-29-year-olds. Of those, nearly 20% had never smoked, according to the research quoted by Chapman. Flavours that might appeal to children. Between them the two reports list cotton candy, gummy bear, chocolate mint, grape, bubble gum, cherry and chocolate, but do not mention any more obviously adult-oriented flavours such as tobacco and menthol. That “e-cigarettes do not emit water vapor” “contrary to popular belief” – although it is not clear that this belief is, in fact, widely held at all. The supposed existence of commercially marketed Hello Kitty-branded e-cigarettes, which we have not been able to substantiate, although it has been used before by others as evidence of e-cig firms targeting minors. That “younger adults and youth who are experimenting with these products may not realize that e-juice contains the highly addictive chemical nicotine, and that the products are classified as a tobacco product”. It is not clear what is meant here by “classified”, unless it refers to the public health department’s own view: neither the state of California nor the federal government formally treats e-cigs as tobacco products. 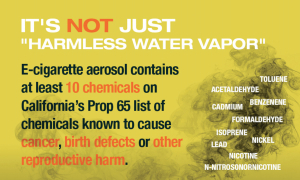 The presence in e-liquid of “toxic chemicals known to cause cancer, birth defects and other reproductive harm” as well as the presence in “both…mainstream and secondhand e-cigarette aerosol [of] at least ten chemicals that are on California’s Proposition 65 list of chemicals known to cause” similar health problems. Proposition 65 is a familiar name for the state’s 1986 Safe Drinking Water and Toxic Enforcement Act. That e-liquid cartridges and bottles “often leak”. That “adults have also mistakenly used e‐liquid in harmful ways, such as eye drops, and have been harmed by exploding cartridges”. If the campaign goes ahead as planned under the next director, not only will the general public be warned about e-cigarettes – with particular attention paid to parents and teens – but healthcare providers will be recommended to “advise and warn e‐cigarette users about toxicity of these products”. Indeed, “current…e‐cigarette users should be advised to quit and offered support”. The reports dismiss as unproven the widespread belief among vapers, as well as some public health advocates, that e-cigs can help with smoking cessation. The two new reports from Chapman and the California Department of Public Health (CDPH) are Electronic Cigarettes: A Summary of the Public Health Risks and Recommendations for Health Care Professionals, and State Health Officer’s Report on E-Cigarettes: A Community Health Threat. The surgeon general is the ranking public health official in the U.S. The office has limited direct power but its holders can be influential in shaping policy. Previous surgeons general have had a significant impact on tobacco control, and indeed it was Luther L. Terry’s first report on smoking in 1964 that confirmed for the wider public the relationship of smoking with lung cancer, led to the U.S. requiring health warnings on cigarette packs, and to a large extent sparked the subsequent five-decade crackdown on smoking. What This Means: We enumerate some of the many concerns expressed by Chapman and his department not because they are individually important (it is difficult to believe that confusion of e-liquid with eye drops is a major public health menace), but because they convey the extreme anti-e-cig sentiment that appears to lie behind their policy suggestions. Public health officials – like the surgeon general – are nearly always cautious on e-cigs, and understandably so. But the Californian documents go far, far beyond caution. It is probably not an exaggeration to say that if it were within the remit of the CDPH under Chapman to ban e-cigarettes, it would want to do so. Viewed alongside the recent Leno bill (and the timing is surely not coincidental) this level of opposition in Sacramento, the state capital, has to be taken seriously – although there does remain the possibility that the next director of the CDPH will be a moderate by comparison. Surgeon general Murthy’s more ambivalent comments, meanwhile, may reinforce what we have predicted before: that the important action in U.S. regulation over the near term is likely to take place at state level, rather than federally.